Hard to believe, but it was only a year ago that I was fighting with the UK Border Control people at Heathrow, trying to get them to allow my two daughters into the country with me for our Year of Living Englishly. I have to admit that I was not an early adopter of Obama. I was a Hillary person. I thought that Obama hadn’t yet earned his chops, though of course I voted for him. I continue to think that Hillary will be an excellent president and I hope to vote for her in 2016. But I also think that Obama is doing an amazing job and I love waking up in the morning knowing that Barack Obama is my president. The week before last I was in Chicago–Hyde Park, on the South Side, home of the University of Chicago–with my sister, helping our mother move her furniture etc. from her apartment prior to selling it. 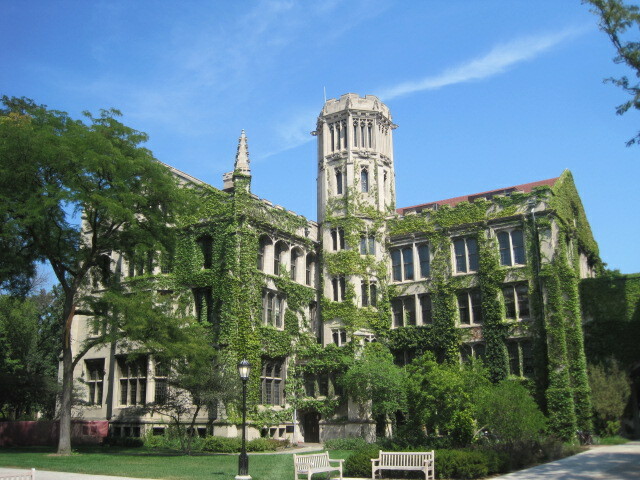 My dad’s old building in the University of Chicago quadrangle. Before becoming president, Barack and Michelle Obama lived and worked in Hyde Park and their children went to school there. I also lived in Hyde Park from ages six to seventeen while attending the same school as Malia and Sasha, The University of Chicago Laboratory Schools, and then again when I was just out of college. My parents continued to live there, so I know Hyde Park well. Last week, wherever I went, and no matter whom I talked with, people had stories about Obama. A woman in her 30s, an employee at the late lamented Coop grocery store where Obama (and I) used to shop, told me about a time when, not knowing who he was but thinking he looked “fine,” helped him grab one of his young daughters as she was heading out the door and hoped that by doing so he would see her as excellent marriage material. (Since Obama did the grocery shopping for the family, this woman had never seen Michelle and had hoped he was a single parent). Another woman who knows him very well and has stayed at the White House a number of times was telling me stories about Obama and Michelle that I really can’t repeat here because they have to do with one person telling the other person the exact errands he needed to run when he returned home on Friday nights from downstate Illinois from his job as a state senator, and another story about the sort of food one person was ordering and having delivered to her home prior to becoming First Lady which didn’t sound at all nutritious but I really can’t say any more than that. 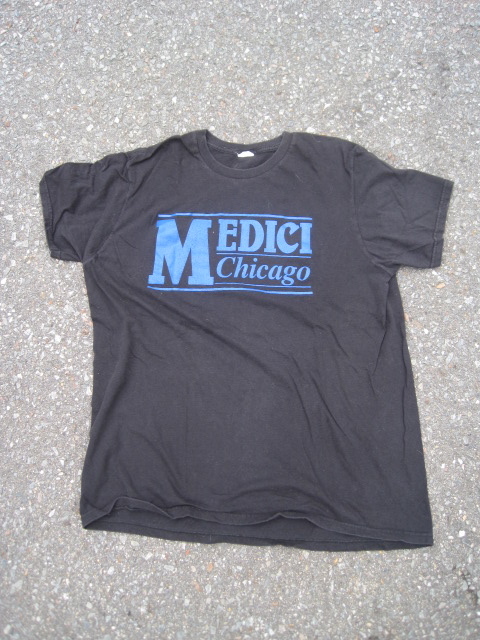 Obama’s favorite restaurant when he was working as a law professor at the University of Chicago and as an elected official was the Medici on 57th Street. 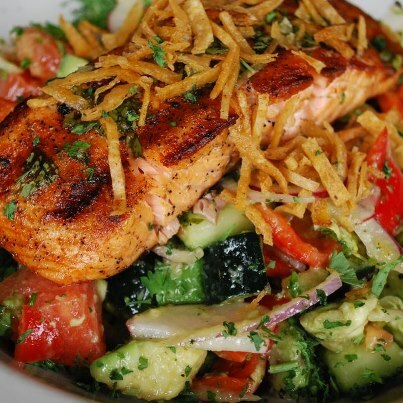 It’s a really great place–terrific food, relaxed ambiance, reasonable prices, and you’re allowed to write on the walls and tables. During the five days I was in Hyde Park, I went there once a day, sometimes twice or three times a day, for pizzas and their killer “Arnold Palmer iced tea,” half iced tea, half lemonade, poured over crushed ice. 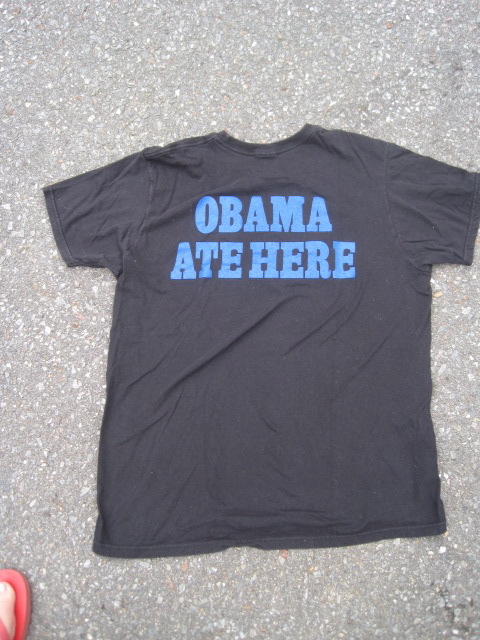 I’d heard that they sold t-shirts proclaiming the fact that Obama was a regular diner at their establishment (or words to that effect), and I wanted one. Desperately. At the maitre d’s station, the hostess told me they no longer sold them. Damn! I thought. I would have really liked that t-shirt! I turned to go, and then I saw the t-shirt pass by me in the kitchen, on the back of a dishwasher (a person, not the machine). She looked at me funny, then went into the kitchen. She came out with a sweaty t-shirt and I handed her the $40 for the man. And this morning, after Romney’s comments about the 47% of Americans who “pay no income tax,” “are dependent on the government,” and believe they are “victims” who are “entitled to health care, to food, to housing, you name it,” I am wearing this t-shirt more proudly than ever. In more ways than one, Obama’s got my back. Loved this post. My father grew up in Hyde Park, and I would have, as well, had he not decided to stay in the Air Force and drag us all around the world. Our favorite assignment was at RAF Chicksands in Bedford; we were there for three years. Oddly, one of the great loves of my life, Jimmy Naisbitt (remember him?) lived on the same street as my father had, Woodlawn Ave., only a few houses away. When I was in England 18 months ago, I was utterly charmed by Oxford. You can check out various photos on my FB page. So glad to reconnect with you! You are a marvelous writer, and I devour each of your blog posts.